‘Kolkata – the city of Joy – depicts a perfect blend of passion and heritage within the urban model of a city which is constantly evolving to suit the growing needs of newer generations and is immersed in competitive consumerism. One can still find a hand pulled rickshaw next to skyscrapers, or trams on busy roads filled with luxury cars. You can walk into a Starbucks or get a hot kulhad (handmade terracotta pot) of tea at any corner of the city. You could fine dine or hit the street stalls famous for their freshly cooked food. A lively former sell-out supper club, Little Kolkata is the brainchild of Prabir and Biswajit, an endearing couple of chaps whose passionate enthusiasm for their venture is palpable. Their eyes gleam as they recommend certain dishes, describing ingredients and cooking techniques in loving detail: we are won over even before we start to eat. The ground floor room in Seven Dials has floor to ceiling windows leading onto the street, black and white tiled floor, wooden tables, chairs and benches, and walls striped in shades of purple and orange – which sound hideous but are actually rather gorgeous. There is a tiled bar over which glasses hang from their stems; earthenware water jugs and cups on every table are pleasingly rustic. When we visited in early October, service was well-meaning but haphazard at best. During our post-prandial chat the chaps earnestly explained the difficulties in transitioning from supper club to restaurant – which are chiefly to do with timing. When you’re used to serving the same dishes, at the same time, to all your diners, it’s a no brainer that cooking to order is going to be trickier to get right. Their honesty was disarming and I hope the kinks have now been ironed out because the food (spoiler alert) is genuinely fantastic and they deserve to do well. Due to the success of the supper club, Little Kolkata already has a loyal fan base, ensuring the place is packed most evenings with fervent foodies, homesick Bengalis and gastrophile millennials with FOMO. Its Covent Garden location should ensure plenty of curious tourists, too – though more prominent outside signage might be worthy of consideration – we walked up and down Shelton St twice before eventually spotting it. We share several dishes that come as soon as they’re ready, as is the mode. 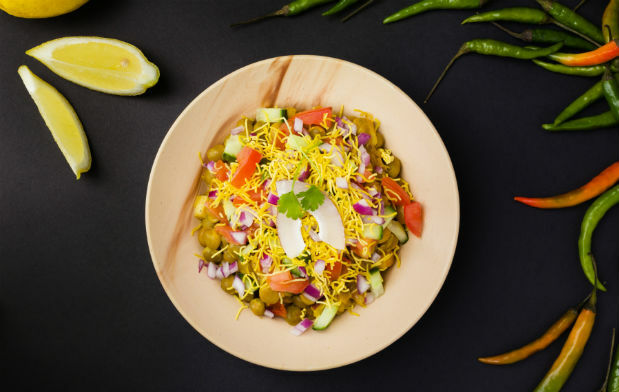 Doi Papri Chaat (‘crisp wafers topped with spicy potatoes and garnished with tamarind chutney, sev and cucumber,’ £6.50) is a superior take on the street food classic, a tasty contrast of textures and flavours. Calcutta Style Chilli Chicken (‘Tangra is Calcutta’s Chinatown and the only one in India, this dish is inspired from that region,’ £6.50) is brilliant: crunchy battered morsels with a similar texture to good old fashioned sweet and sour pork, unencumbered by sweet, gloopy sauce but with proper lingering chilli heat – no pandering to Western palettes here. As a major port in a unique location, Prabir tells us, Calcutta is such a melting pot of cultures, with so many external influences on its cuisine, that he wants his menu to reflect that. Golda Chingri Malai Curry (‘jumbo prawns cooked in coconut cream – a real Kolkata delicacy,’ £15.50) nods in a South Easterly direction, the huge, meaty crustaceans languishing in a creamy, delicately spiced broth, a complete contrast to their fiery poultry predecessor. We could also have gone for Murshidabadi Chicken Moghlai (‘whole baby chicken cooked in a cashew nut and saffron rose water – a tribute to the Mughal influence on Calcutta’, £14), which sounds more than worth a try next time, but Biswajit steers us in the direction of Khaligater Kosha Mangsho (‘goat meat cooked in rich flavoursome sauce’) which is an absolute knockout, the meat fork tender, its intensely savoury gravy heady with aromatics. With gleeful pride that we enjoy it so much, Prabir tells us it’s his mother’s Sunday lunch recipe, which came from her mother before (and probably her mother before her). There’s really nothing much not to like about these guys. The Porota recommended, with almost Messianic zeal, to scoop the whole lot up, has been rolled again and again, to exquisitely light puffiness, with a delicate, crisp exterior. Meat and juices melt into bread, creating… I was about to use the words ‘divine alchemy’, but suffice to say it was bloody yummy. For pudding we shared Calcutta Mishti Doi (‘baked sweet yoghurt’, £3.50) and Park Street Kulfi Falooda (‘Gulkand’, £4.00). The baked sweet yoghurt has a texture not dissimilar to cheesecake, and very nice it is too, but the kulfi is extraordinary, the Mini-Milk like ice cream on a stick standing in a pool of vivid pink (‘gulkand’ turns out to be candied rose petals) and violet – chia seeds, which cling, frozen, to the lolly, creating another dimension of texture and flavour. As we were there at lunchtime we limited ourselves to a modest bottle of Pinot Grigio (£25), from a decent list that encompasses Chablis (£50), New Zealand Pinot Gewurztraminer Riesling (£45), Argentinian Malbec (£39) and Organic Chateau Sainte Marguerite Ros é (£45). Oh OK, not quite just the one bottle: we reckoned the puddings were good enough to warrant a couple of glasses of honeyed Black Muscat Elysium (USA), bizarrely available by the bottle at £34 – another of those quirks that make this place so intensely likeable.